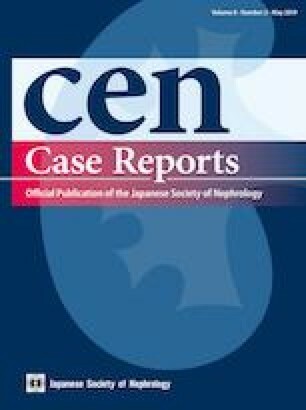 A 69-year-old woman who presented with severe renal dysfunction and diffuse alveolar hemorrhage was diagnosed with pulmonary–renal syndrome (PRS) based on the coexistence of serum myeloperoxidase (MPO)–antineutrophil cytoplasmic antibodies (ANCA) and anti-glomerular basement membrane (GBM) antibodies (Ab). Hemodialysis was started; plasma exchange and intravenous methylprednisolone pulse therapy were administered followed by oral prednisolone administration. Pulmonary hemorrhage decreased; however, renal dysfunction persisted. On maintenance hemodialysis and prednisolone therapy, MPO–ANCA and anti-GBM Ab became negative at 4 and 10 months, respectively; thereafter, they became positive again at 18 and 35 months, respectively. At 36 months, there was relapse of pulmonary hemorrhage. Plasma exchange and intravenous methylprednisolone pulse therapy were administered; pulmonary hemorrhage ceased, and both antibodies became negative. It is known that PRS cases that are double positive for ANCA and anti-GBM Ab occasionally relapse after remission, and, even though they are double positive at initial diagnosis, most relapses occur with reappearance or re-elevation of ANCA but with absence of anti-GBM-Ab. Therefore, this was a rare relapsing case that presented with double-positive serology. Further, our observation that the reappearance of ANCA preceded that of anti-GBM-Ab suggests that ANCA contribute to the reproduction of anti-GBM Ab. This case report was presented in the 18th international vasculitis and ANCA Workshop (Tokyo, Japan, 2017).